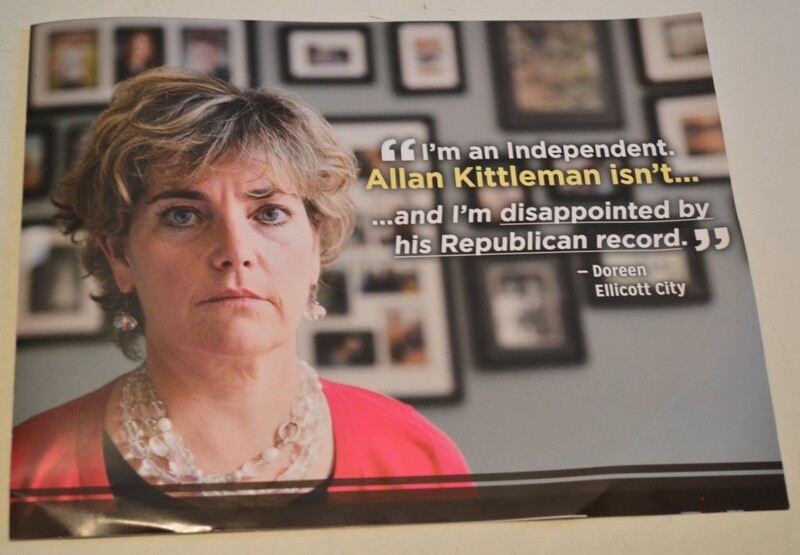 Above: The front cover of a new mailer attacking Allan Kittleman's record that arrived in mail boxes Tuesday. Photos of the full mailer are at the end of the story. 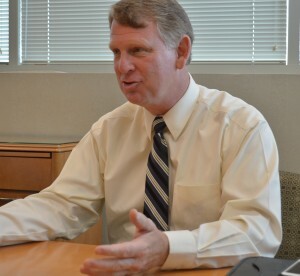 Howard County Democrats have launched a website attacking the record of Republican state Sen. Allan Kittleman, who is running a competitive race for county executive against Democratic County Council member Courtney Watson. 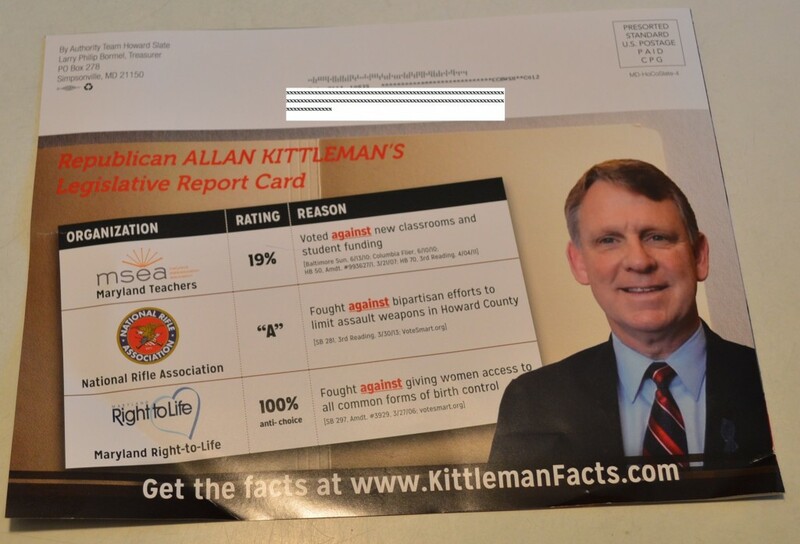 UPDATE: KittlemanFacts.com and a new mailer challenges Kittleman’s positions that put him at odds on issues that have strong appeal to Democratic voters — school funding, abortion, environmental policy, gun control and the minimum wage. The site and the mailer are designed to label him as a loyal Republican, and not the “independent leader” he proclaims on his campaign signs. Kittleman needs Democrats and independents to support him since Republican make up only 28% of Howard County’s active voters. The website is sponsored by the Team Howard Slate that includes not only Watson and fellow Council members Calvin Ball and Jenn Terrasa, but also Del. Guy Guzzone, running for Senate; and Lt. Gov. Anthony Brown and current Howard County Executive Ken Ulman, the Democratic nominees for governor and lieutenant governor. The attacks come as no surprise to the Kittleman campaign, which has already begun a series of weekly press briefings on issues Watson and others Democrats are raising against him. Last Monday, Kittleman held a briefing, attended only by MarylandReporter.com, on women’s issues, particularly abortion and contraception. “A woman should be able to make the decision with a doctor,” he said. But Kittleman is also frustrated that issues about abortion or gun control would come up since county executives do not make policy in these areas. “It seems to be an act of desperation,” said Kittleman. who said his own polling shows him ahead of Watson. But he concedes he is open to attack on many issues “because I have a record” in Annapolis. The KittlemanFacts website also highlights his sometimes low ratings from the teachers union, the Maryland State Education Association (mislabeled the Maryland Education Association on the website), which has already endorsed Watson through its Howard County local. Kittleman hasa lifetime rating of 16% from the League of Conservation Voters, the website says. The website includes video of Kittleman debating on the Senate floor with Sen. Brian Frosh, now the Democratic nominee for attorney general, over the constitutional right to bear arms. In the interview, Kittleman said he did not vote for the 2013 Firearms Safety Act for several reasons, particularly because he thought that the requirement for fingerprinting gun buyers went too far. In another five-minute video, Kittleman is shown addressing the Howard County Republican Club, where he lays out his positions on a string of labor issues that have earned him the enmity of unions. These include his support of right-to-work laws and his opposition to prevailing wage laws and other measures that ensure union-level wages are paid for government contracts. According to the latest campaign finance report, the Team Howard Slate has not raised or spent more than $1,000 since January. UPDATE: Clearly the mailer indicates the group will spend much more than that. Photos below.